In our video, we decided that the font of the band and song name at the start of the music video would be the same as the font used on the digipak. In order to decide what font to use, I looked at other band's fonts and logos, of both metal core and rock genres. Through my research, I found that all of the bands logos and fonts are either black font with a white background or white font with a black background. On my right you can see some of the fonts I looked at including from Bullet for My Valentine and Asking Alexandria. I also went to dafont.com and found a font called "Mom's Typewriter". We all really liked this font and agreed that we might try it out. 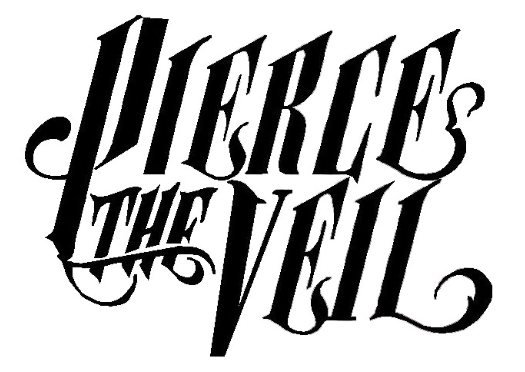 Fonts such as Pierce the veil and Bullet for My Valentine, are almost gothic-looking. However a few of the fonts are also very simple block letters and have clean edges such as 'Asking Alexandria'. So, as the convention goes, Metal Core fonts are either detailed/handwritten or simple and block. Therefore, we will be using one of these two options.